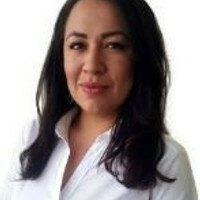 Marilyn is our Destination Expert in Ecuador. "The traveler has left a 4-star review.". "She had planned and arranged my trip very well, and the price was reasonable. My trip was a highligh...". This tour gives you the opportunity to see some of the world's most unique places in a mere 12 days! The wonderful experience starts right after your landing at Quito airport, where you'll be met in person taken to the Mitad del Mundo, to stand simultaniously in the northern and southern hemispheres. On the next day you will visit the Otavalo market, the biggest artesian market in Ecuador. Further on, you'll spend time in the Cotopaxi National Park and see the highest snow-capped, active volcano in the world! The following days will be then spent visiting the Quilotoa Lagoon, with its emerald sparkling lake, and Baños de Agua Santa, before moving on to the amazing and breathtaking islands of Galapagos to observe unique animals, relax at the beach or snorkel and discover the underwaterworld. After being picked up from the airport you will start your tour at the perfect place, on the Equator! 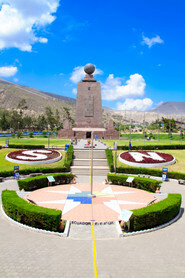 Take your picture at the Mitad Del Mundo as you stand simultaneously in both the Southern and the Northern Hemispheres. Learn about the rich culture of Ecuador with a visit to the national museum. During your stop at Museum Intiñan you can see for yourself the uniqueness of this midpoint - watching the water swirl down the drain clockwise and counter-clockwise, or defy gravity by balancing an egg on the tip of a nail. It's then on to relax at your hotel in Quito for the night, and prepare for your adventure! Your first stop today will be in Cayambe where you will taste the town’s famous bizcochos (biscuits cooked on an open fire) and admire the beautiful scenery of El Lechero, Otavalo and Lago San Pablo. Discover the most famous artesian indigenous market in Ecuador, the Otavalo, where you will have free time to explore and purchase local handicrafts, and where your guide will provide an explanation about the local indigenous culture. You'll then continue to the town of Cotacachi, then onward to beautiful Laguna Cuicocha. Today you will visit one of the highest active, snow-caped volcanoes in the world. Cotopaxi’s symmetric cone rises from a vast plain that is home to lamas, condors and herds of wild horses. This amazing adventure includes hiking and scenic drives through the park’s majestic landscape. You'll also receive information about the different fauna, flora and history of the park. Cotopaxi has its own micro-climate and the weather in the area is very unpredictable, so please be prepared with warm clothes. You begin the day with a visit to a local market at Saquisili / Pujili (Thursday/Sunday). Enjoy beautiful views of the Andes on the drive to Quilotoa lagoon, where you’ll pass through the ancient canyon of Zumbahua as well as many towns and farmlands. You'll then continue on to visit an indigenous home where you have the opportunity to interact with the local people. The tour concludes with an optional hike down into an extinct volcano crater to Quilotoa Lagoon, a unique sparkling emerald lake. The return hike is steep and takes approximately one hour with the option of renting a mule. After the tour, you'll make your way to the unique town of Baños de Agua Santa, near the active volcano Tungurahua! 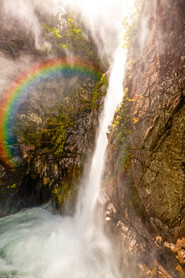 Beautiful waterfalls and lush forests surround the tranquil town of Baños. Baños de Agua Santa, also known as Baños, is a city in eastern Tungurahua province, in central Ecuador. Baños is one of the most popular cities in Tungurahua for adventure and tourism. It is known as the “Gateway to the Amazon” as it is located on the Pastaza River in the High Amazon Basin. The city is a major religious center, as most Catholics believers say that the Virgin Mary appeared nearby the waterfalls to protect the city from natural disasters. The city itself boasts a beautiful central park and waterfalls that include the magical “Pailón del Diablo” and “Manto de la Novia”. It'll then be time to head back to Quito and prepare for the next amazing part of the trip. Your flight from Quito arrives at noon at Baltra Island. After a nice lunch you board your yacht and head off to North Seymour Island. Here lives the biggest colony of frigate birds, together with swallow-tailed gully and pelicans. North Seymour Island is also home to a big group of old iguanas, which had been brought here from the nearby Baltra Island many years ago. Bursera malacophylla, a small endemic species of Palo Santo trees, only exist on this and three little neighboring islands. In the afternoon you witness a special spectacle: sea lions surf on big, from the west coming waves. This morning you'll arrive to the small, east offshore Bartholomé Island, one of the most photographed places of the archipelago thanks to its striking rock needle. This young island offers a variety of dramatic volcanic formations and a moon-like landscape with tuff cones and small lava tubes. These different rocks even served US-Air-Force pilots as targets for shooting practice during the Second World War. A narrow mangrove line separates the island’s two beaches. While swimming and snorkeling at the north beach you often see penguins. Reef sharks and rays live at the south coast and from January to March green turtles nest here. It's then on to Sullivan Bay in the East of Santiago Island, a bay famous for its distinctive lava formations. Toward evening you are given another opportunity to swim in the sea or snorkel with sea lions. 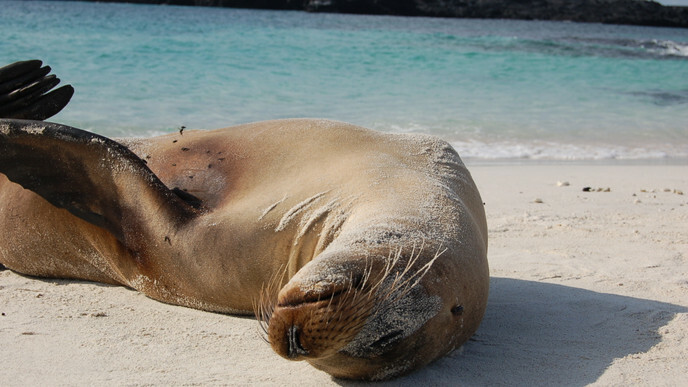 Your morning visit brings you to the beach of Bachas at the north coast of Santa Cruz Island. It is one of the most important beaches where sea turtles nest. Behind the dunes, in the small lagoon, you can observe flamingos, blacked-winged stilts and bahama pintails. The wide beach invites you to swim or snorkel. After lunch the boat takes course west-southwest, and onto the next excursion at the dragon’s mountain, “Cerro Dragon”. Here you'll be able to view the land iguanas of Santa Cruz living in this unique vegetation. Your last excursion brings you to Puerto Baquerizo Moreno, which is the archipelago’s administrative center on San Cristobal Island, where you visit the newly opened visitor center. It shows a great exhibition about the history of nature and settlement on the Galapagos. 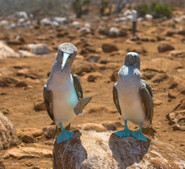 At midday it will be time to bid adieu to the Galapagos, as you'll be transferred to the airport at San Cristobal Island for your flight back to the continent at Quito. From here, you will be able to connect on to your flight back home, or to your next adventure. See you next time in Ecuador!